Dr. Philip Willink stands at the shore of Chicago’s 63rd Street Beach, looking out on to Lake Michigan. He asks this question of anyone who joins him on his frequent trips to the shore. Willink is a senior research biologist at the Shedd Aquarium, and so he often visits the shoreline to check on the health of the lake. “Something I like to do is whenever I go out, I try to do as many things at once: monitoring invasive species, looking for endangered species and just sort of assessing the community on the Chicago Lakefront,” Willink said. And from the surface, it’s impossible to see it all. According to Willink, at any given spot, there could be tens of thousands of fish swimming around: A little-known fact for many local swimmers. Another example: Willink said there are likely quadrillions of invasive zebra mussels and quagga mussels in Lake Michigan. You can hear their dead shells crunch as you walk along the shore. This year, Willink said, he’s stumbled on a few species that he isn’t as used to seeing, like Coho salmon, perch and bloaters—all fish that favor cooler, deeper waters. On average, temperatures in Lake Michigan this summer have been much cooler than normal. According to data from the National Oceanic and Atmospheric Administration, surface temperatures have been about 2.75 degrees Celsius below average. The managers of this data believe that’s likely because of all the ice cover that came along last winter. The Great Lakes were at least 90 percent ice covered last winter, and that hasn’t happened since 1994. Willink said all that cooler water encouraged fish that usually stay deep, deep down in the lake to swim up to the surface. “Everybody thought it was a harsh winter, and we’d have fewer fish. I’ve actually found more this year,” Willink said. “It may very well be that Great Lakes fish like harsh winters, because after all, that was a much more typical winter. But some other fishermen aren’t so sure of that connection. 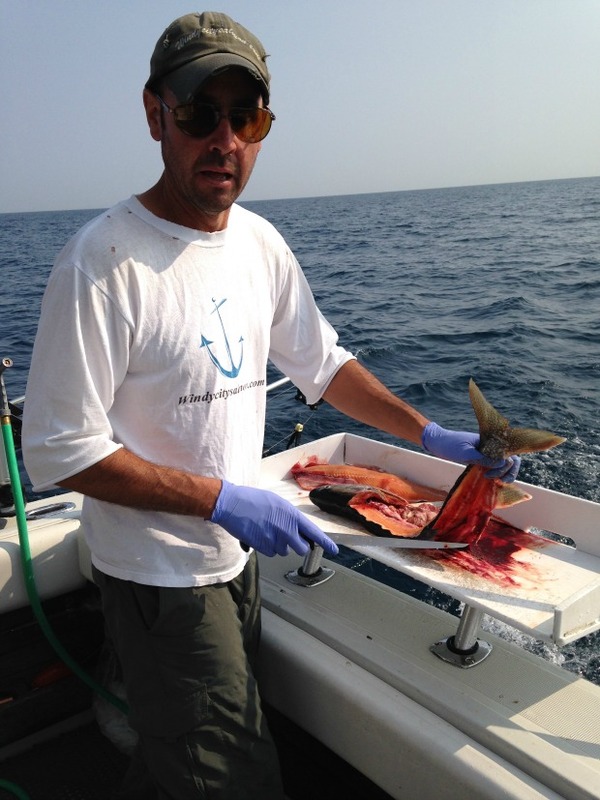 Captain Rick Bentley is the owner of Windy City Salmon Fishing Charters. He takes groups fishing off Waukegan Harbor in Lake Michigan, so thriving fish make for better business. And he said this spring, the Coho salmon fishing was the best he’s ever seen. Bentley said he remembers all the ice cover. It covered the harbor until April 10th, which he said is unusual. But he’s not convinced the two things are related. According to Marc Gaden of the Great Lakes Fishery Commission, Captain Rick Bentley may not get the chance to make that assessment. Gaden worked on this year’s national climate change report and he said all the research points in the opposite direction of the thermometer. “The downward trend is quite unmistakable since the 1970s. And so we’ll see fewer and fewer winters where we’ll have that significant amount of ice cover in the Great Lakes basin, that’s clear from the trends. And the models of climate change scenarios suggest that’s not going to change,” Gaden said. And in the decades to come, Gaden said that could, among many other things, make the lakes “quite an inviting place to some of the invasive species that we’re very concerned about like Asian Carp.” According to Gaden, that warmer water could also lead to an expansion of species like sea lamprey, quagga and zebra mussels that are already in the lake. Back at 63rd Street Beach, Willink said on the one hand, sometimes people tend to forget that the Great Lakes are always changing and they always have been: Fish, animals and plants have survived both warm and cold years before. And, he adds, it is hard to really know how one pattern will affect the ecosystem long term. But since this has been an unprecedented rate of change, how the fish will respond is an open question.